An Audio CD to go with the Bible Map tracts. Millions of people world-wide also wonder, "Why do I exist? Why am I a living, breathing human being?" As you hear this CD and follow the enclosed "Bible Map-God's Plan of the Ages" chart and quiz, you may also want to help others hear and see this "answer for life and existence." One of the folded 4-color printed Bible Map tracts will be enclosed with each of the CD's produced by us. The speaker on the CD is Leon Bates, author of the Bible Map-God's Plan of the Ages tract. This CD is not copyrighted. You may make copies on CD's or cassettes FREE for the glory of our Lord Jesus Christ. 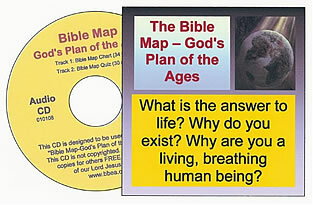 Track 1 of the Audio CD takes listeners through the "Bible Map" CHART explaining God's Plan of the Ages (34 minutes). Track 2 takes listeners through the QUIZ questions and Scriptures on the back of the Bible Map tract (30 minutes). It clearly explains God's Plan of Salvation BY GRACE through FAITH in the Lord Jesus Christ. The goal is to help people know the answer to their life and existence. It is to help them KNOW they have established a personal relationship with the Lord and that they are guaranteed eternity in heaven with the Lord… with PROOF. That PROOF is presented with clear promises in the Bible, God's Word, and as shown with Scriptures on the Bible Map tract and audio CD. These "Bible Map Audio CD and printed Bible Map Tract Combo Packages"
are available in quantities for for Bible Classes, Witnessing and Soul-Winning.